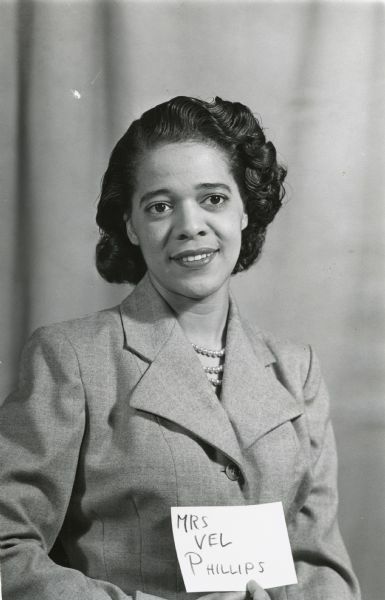 She was the first African-American woman to graduate from the University of Wisconsin Law School in 1951. She was the first female and the first African-American elected to the Milwaukee Common Council in 1956, where she pushed city leaders to recognize the inequalities facing minorities in the city, including housing discrimination. She served on the council until 1971, when she became the first female judge in Milwaukee County. "I just thought that I would have a chance to really make a difference," Phillips told Wisconsin Public Television in it's documentary, "Vel Phillips: Dream Big Dreams." Phillips helped lead efforts to create more housing rights in Milwaukee and remained politically active into her 90s. In 1962, Phillips introduced a fair-housing ordinance to the Milwaukee Common Council. It was rejected 18 to 1. Phillips introduced the bill several times between 1962 and 1967, with her vote being the only one in favor. The proposal sparked a legislative battle and her voice on the common council served as one that represented people who she marched side-by-side with to fight for equal rights. In 1967, Phillips teamed up with the NAACP Youth Council and Fr. James Groppi in leading and marches for open housing that continued for 200 days. Born as Velvalea Hartense Rodgers on Feb. 18, 1924 in Milwaukee, she went to North Division High School and graduated from Howard University in Washington, DC in 1946. In 1947, she met and married her late husband, W. Dale Phillips, who was a lawyer. After graduating from Howard University, the couple moved to Milwaukee before both attending UW Law School, where the two became the first African-American couple to graduate from. Gov. Scott Walker honored Phillips on Wednesday by remembering a moment in 2009, when Milwaukee County's Children's Court Center was renamed the Vel R. Phillips Juvenile Justice Center. Walker was county executive at the time. When asked why there aren't more African-American's holding statewide offices in Wisconsin, Lee said that's a hard question to answer, but sees progress in Mahlon Mitchell, an African-American, running for governor.